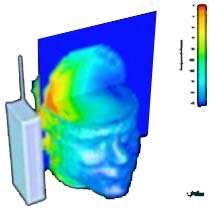 Microwave radiation from Cellular Phone Transmission is in immediate proximity to the brain. By comparison, ham radio microwave transmissions require a distance of several yards between the antenna and neighboring houses. Microwaves have wavelengths approximately in the range of 300 MHz to 300 GHz. The microwave range includes ultra-high frequency (UHF) (0.3-3 GHz), super high frequency (SHF) (3-30 GHz), and extremely high frequency (EHF) (30-300 GHz) signals. A microwave oven produces microwaves at a frequency of approximately 2.45 GHz. Microwaves are used in broadcasting transmissions because microwaves pass easily through objects (buildings, mountains, etc.) with less interference than longer wavelengths. Radar also uses microwave radiation. Wireless Internet Access services can be found in many countries (but not the USA) in the 3.5–4.0 GHz range. Ham radio requires an operator to place his transmitting tower several yards away from any neighbor houses. The operator himself can be closer to the source of radiation, as he is in a "controlled RF" area, that is, he can control the transmission process. His neighbors are designated an "uncontrolled RF" area, in that they cannot control the radiation emanating from the tower. The study of the effects of the cell phone's microwave transmission on the tissues of the body has been relatively brief, (as the mass useage of cell phones has been a recent phenomenon). But much has indicated the danger of cell phone useage upon living tissue even in that short span of time. It was talked about much more frequently in public forums such as newspapers and radio talk shows when the cell phone's popularity started to rise. Then suddenly, things got strangely silent. A good detective would suspect that the multi-billion dollar wireless industry was "somehow" capable of neutralizing the debate. So now you have everyone - including kids - sticking microwave boxes beside their skulls for several hours a week. And a coincident increase in cancer, which cell phone advocates dismiss with adjectives like "insignificant increase..."
We always knew cell phones would fry your brain, now there's some evidence. A recent study in Sweden showed evidence of people in rural areas having a higher chance of brain tumors from the higher radiation levels required to boost the cell phone signals for those rural. "We found that the risk of brain tumor was higher for people living in rural areas than in towns. The stronger the signal, the higher the risk," said Lennart Hardell, lead author of the study and a professor of oncology at University Hospital in Orebro. The team monitored 1429 people with tumors, both malignant and benign and 1470 healthy people from various regions of Sweden. They determined that people who lived in rural areas and used a cell phone for at least three years were three times more like to contract a brain tumor. If used it for 5 or more years, then your chances are quadrupled. The prospects don't look promising for kids who use their cell phones all the time and live in the country. The scientists did say these results were preliminary and much more study would need to be done for conclusive proof. "We still cannot exclude that there might be other undetected risks in the countryside, but we have tried to adjust the results, as far as we know," said Hardell. For now, he suggested it was better to "operate the precautionary principle". "Use hands-free kits when possible and children should only be using mobiles when necessary," he said. Radiation from cell phones and microwave ovens has been called "harmless" by manufacturers. They label it "Non-Ionizing" radiation, and we're told that makes it OK. The fact is that there is a spectrum of radiation ranging between "ionizing" and "non-ionizing", and the risk level has no clear cut-off point. Additionally, there is no "safe" radiation, there are only varying levels of danger. In the early 20th century, radon and radium-enriched spa waters were "recommended" for a wide range of minor ailments. In time the harmful effects of ionizing radiation became known and its use carefully restricted. Now "non-ionizing" radiation is being glibly referred to as "safe" by mainstream media. But it takes time for results to be made certain, and until then, common sense must err on the side of caution and say "It's abnormal to expose the body to these radiation sources & therefore it's the better part of wisdom to avoid them." The eagerness of manufacturers of cell phones and microwave ovens to "move product" yields a powerful financial incentive to conclude, "Let's crank this crap out and let the future worry about any health risks." Non-ionizing radiation is certainly not categorically "safe". But it's comforting to think that if you like playing with radioactive toys, and industry & media are more than willing to take advantage of that vain fantasy on the part of consumers.